Chiengmai. Tonsak. Kungrao. Surin. The names of the star elephants at the Copenhagen Zoo are Thai because they are from Thailand. Actually, most of the elephants at the 149-year-old zoo are principally from Thailand due to long-standing relations between the two countries. The first two Thai elephants, Chang and Eng, arrived in Denmark in 1878 as a gift from the Danish consul in Siam. The zoo’s successful elephant breeding programme began when Their Majesties the King and Queen gifted three elephants — Chiengmai, Lampoon and Buag Hah — to Their Majesties Frederik IX and Queen Ingrid as a royal gift during their state visit to Thailand in 1962. In 2001, Denmark received another three elephants from Thailand. Two of them — Tonsak and Kungrao — were royal gifts from Their Majesties the King and Queen to Their Majesties Queen Margrethe II and Prince Consort Henrik during their visit to Thailand. Surin is a gift from the people of Surin province to the Danish people. ‘‘The Thai elephants are our biggest attraction,’’ said the zoologist, adding that they are considered the Queen’s royal elephants in Denmark. qele2The royal elephants were moved from castle-like quarters to a more natural and stimulating abode this year, a ceremony presided by Prince Consort Henrik and his grandson Prince Christian. The new Elephant House is covered with glass domes to allow more sunlight, with better temperatures and humidity control. The sand-covered floor helps protect the elephants’ legs and feet while providing a soft ground to lie on. 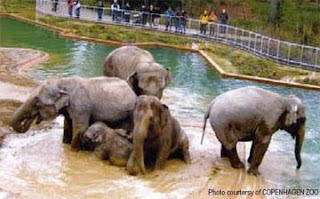 The outdoor area is shaped like a dry river bed with mud holes and a deep ditch for the elephants to bathe. There is also a distance between each feeding ground, thus forcing the elephants to walk for food as they would do in the wild. The new Elephant House is designed by famous UK architect Norman Foster.